In 1997, George Lucas re-released Star Wars. Among the changes were a half-second tweak to the cantina scene where Han shoots Greedo. In the original version, Han preemptively shoots the bounty-hunter that has come to kill him. In the revised version, Han lets Greedo shoot first. Greedo’s shot misses and Han shoots Greedo. 1. It’s implausible and contrived that Greedo misses his shot. Greedo has his gun aimed at Han Solo. Neither Greedo nor Han is moving. The two are roughly five feet away from each other. Everybody—even drunken Ewoks tripping on LSD—could easily hit this shot. 2. It reduces Han Solo from a competent hero into an idiot that got lucky. Given the choice between shooting first or waiting until Greedo shoots first, only an idiot would wait because (as above) Greedo is virtually guaranteed to hit. The new scene also reduces Greedo into an idiot that is apparently the worst shot in the galaxy. The original scene was a fight between two competent shooters that was resolved by craftiness and guile. The new scene is a fight between two idiots that is resolved by a contrivance. If you absolutely need to incorporate contrivances into your story, I would generally recommend having luck play against the protagonists. It’s more dramatically satisfying when protagonists overcome bad breaks rather than ease through obstacles just because they got lucky. List the 25-50 most important events in the plot. Place one event each on a post-it note. Organize as many of the post-it notes into a cause-and-effect chain as you can. 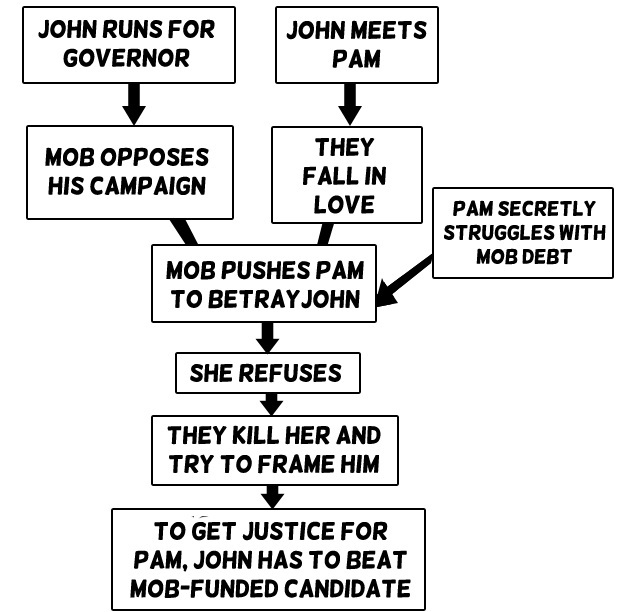 For example, here’s a political thriller with two main plot threads. (I wouldn’t recommend more than 3 plot threads). For more information on how to use your map to tighten up your plot, see below.